Great violin-makers of the seventeenth and eighteenth centuries, the Stradivari and the Guarneri, designed their instruments (cellos included) to mimic the human voice. Students of stringed instruments are often urged by their teachers to make their instrument sing. Yet the cello is considered to be the most voice-like of all instruments, acoustically and expressively, with its range from basso profundo to one that competes with coloratura. Even the timbre of the cello is quite close to the timbre of the singing voice. The ultimate step? A concert of songs ‘sung’ by a cello. The fourth concert of the 2018-19 season of Sunday Music in the Garden Room will bring just that. 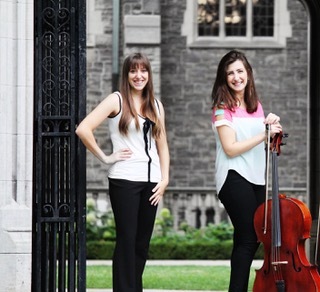 In their program, entitled Stolen Art Songs, cellist Beth Silver and pianist Jenna Richards have chosen works that sit particularly well with the vocal properties of the cello: songs by Richard Strauss, Schubert, Vaughan-Williams, Dvorak, Rachmaninoff, Poulenc , Faure, Debussy, and, for good measure, some Ginastera dances, Poulenc’s cello sonata, and a little Gershwin. Both Silver and Richards are seasoned performers, despite their relative youth. A recent Master’s degree graduate from McGill, Silver has been heard across Canada and the US, in Europe, Israel, and China, most recently with Matt Haimowitz’s all-cello group, Uccello, at the Napa Valley Festival del Sole, the Kammermusik Festival in Salzburg, Austria, with the Toronto band Ozere at Celtic Connections Festival in Glasgow, Scotland, and on a Debut Atlantic tour with the Ladom Ensemble, with which she has a Prairie Debut and Jeunesses Musicales tour in 2019. Richards, a Halifax native, is a graduate in piano performance from the University of Toronto, and is at present with the Ottawa Arts Council and the Ottawa Chamber Music Society, the Ottawa Chamber Choir, and the Canadian Centennial Choir. Among her engagements she has performed at Scotiafest in Halifax, the Four Seasons Centre for the Performing Arts in Toronto, the Orford Arts Centre in Quebec, Ottawa Chamberfest, the National Arts Centre in Ottawa, and the TSO’s Young People’s Concert Series in Toronto.